A.A.R.Jain school is a co-educational school, affiliated to the CBSE providing all-round comprehensive quality education aimed at character building and sound development of personality. For classes XI and XII, it has Science (Medical and Engineering), Commerce and Arts streams. 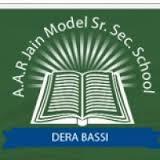 Are you Interested in AAR Jain Model Senior Secondary School, Dera Bassi.